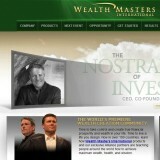 Wealth Masters International – WMI by Kip Herriage, found at wmitoday.com, has already been submitted for review. If you would like to see a review of Wealth Masters International – WMI, simply add your vote on it using the following link: Add Vote for “Wealth Masters International – WMI“. Then click on the “Vote For Review” button. When enough votes have been accumulated, we will start the business research process and get a review of “Wealth Masters International – WMI” completed a soon as possible. If you have any experience with “Wealth Masters International – WMI”, good or bad, we want to hear about it. Go below and submit your own review to let others know about it. Wealth Masters International – WMI a Scam?